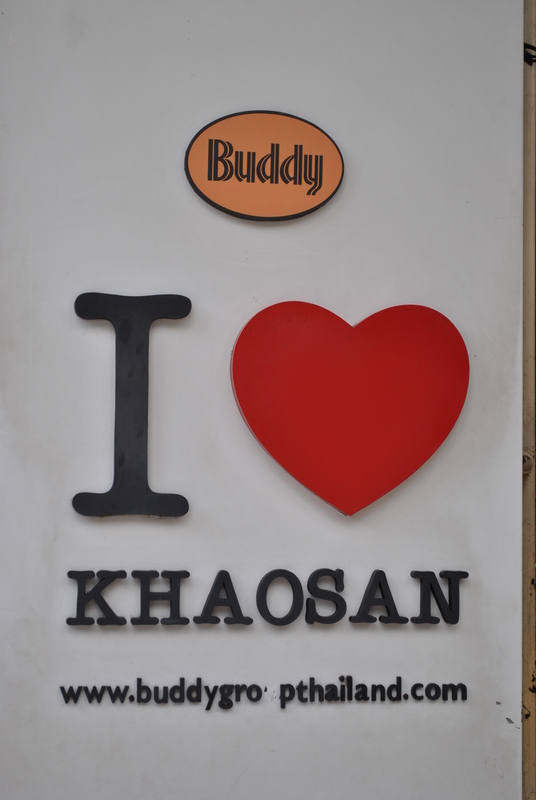 As part of my duties as travel guide I take H to the throbbing nervecentre of backpackerdom, the Khao San Road. 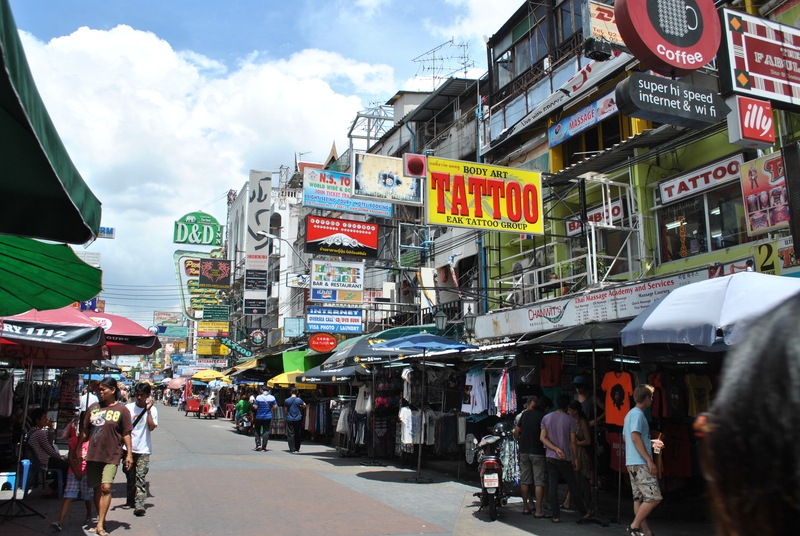 More than just a street now, Thanon Khao San spills into several adjacent thoroughfares and is almost a tie-dye hippy, internet cafe, bus ticket-booking district of its own. It’s an interesting walk to Khao San, through some of the old streets with their vendors dedicated to selling Buddhas, shrines or large gold-framed pictures of the King. As we get closer to Khao San it’s all about food, with hundreds of stalls offering cakes and biscuits and dried fruit and snacks of a hundred varieties. The choice is almost overwhelming. We buy fresh juice. At least there are no touts here. Bangkok is well known for ‘helpful locals’ who hang around the Grand Palace and its environs to mislead tourists by saying this or that is shut so they must get in a tuk tuk whereupon they then end up in some handicraft centre or buying dodgy gems. When we started walking, H kept talking to Thais who would then try and sell him a tour or convince him to go somewhere in a tuk tuk. While he thought they were trying to be helpful, I knew it was only a matter of time before we found ourselves in a shop we couldn’t leave without buying a wooden elephant, a dozen bronze statues and a hand-carved dining table. ‘Stop talking to those guys hanging around with maps,’ I told him. ‘They just want to sell you something and we are not interested in buying it.’ They didn’t like me. As I’d march over in the middle of some spiel about what a bargain this particular tour was while H’s eyes turned glassy, all I had to say was: ‘I’ve been here before,’ and they would get this grumpy look knowing the jig was up. We reached Khao San and H kept saying he thought it must be fun at night. ‘It’s the same at night, just noisier and with more people in bars,’ I said. H doesn’t drink, so bars and farangs getting drunk are of little interest to him. 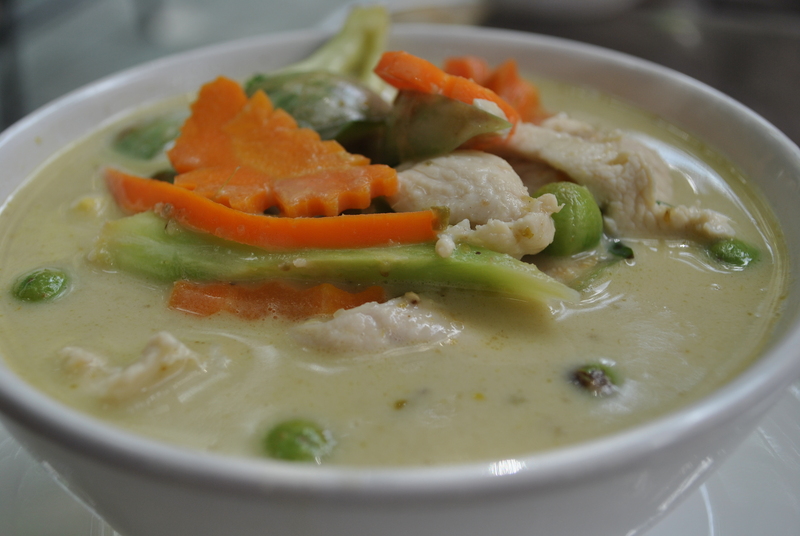 My feet hurt and so we sat at a cafe on the main drag called The Hub and ate surprisingly good green chicken curry. H grumbled about the price (about 120 baht), but the portion is generous and the ingredients are authentic. Then he decided he wanted to see the palace, so he tried to get a tuk tuk. It’s getting a bit late by now, as from memory the palace closes early, but we go and look. The tuk tuk driver wanted 200 baht for the 5-10 minute drive. H would have paid it, but I tell him we can get a cab across town for half that, and the tuk tuk driver gets angry and yells at us. We find another tuk tuk driver and H pays him 50 baht, which is a good fare for that trip. The palace is shutting as we arrive, and a hundred touts surround H to sell him things. I must have a certain jaded look as no one comes near me. I drag H away and we walk off to find Wat Pho and he gets entangled with another bloke who convinces him to take a tuk tuk to the Chao Phraya riverfront (for 5 baht) and then take some canal tour. He’s not listening to me, so I just let them talk at each in a mutual lack of comprehension. I don’t care by this stage: if H wants to sign on for an expensive sightseeing trip he can go for it. On reaching the riverfront we found a bloke with a boat who wanted 1,200 for a tour. H has gone into bargaining overdrive now and offers him 100 baht. The boat man gets angry and yells at him. I sat and watched some pointless discussion and then we left. H informed me that we could get a boat down the river to Saphan Taksin and then take the Skytrain. I had suggested this as an option for our return about four hours earlier. We walked through an old riverfront market to reach the next express boat stop. I’ve explored sections of the riverfront before, but never seen this market, and it’s fascinating in its disheveled busyness. The riverboat is crowded and H takes a hundred photos of every other boat and all the passengers. 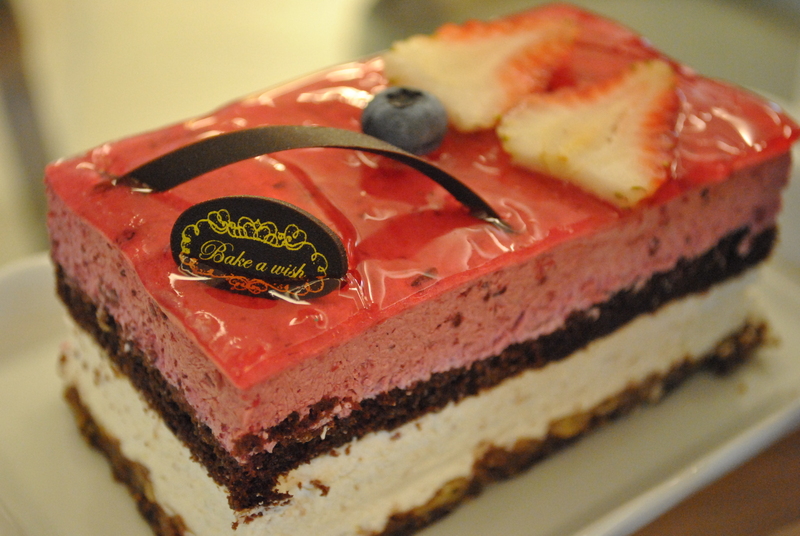 Back in the centre of town, we stop in the basement of the Siam Paragon mall for a lychee berry slice at the Bake a Wish Japanese cake cafe. The berry layer is very tangy, the vanilla layer is creamy, and it has a crunchy chocolate base. The Japanese, with typical diligence, have mastered cake and excessive deployment of dairy. Siam Paragon has too many temptations and a wonderful gourmet market which is pricey but rather fabulous. If I lived in Bangkok, I would definitely need to return. This is exactly the kind of place a farang in desperate need of good coffee and chocolate requires.